Marcus Elkanah Setzer was born 10 Mar 1830 in Lincoln/Catawba County, NC. He was the first child born to Jacob Lanier Setzer and Delilah Deal. 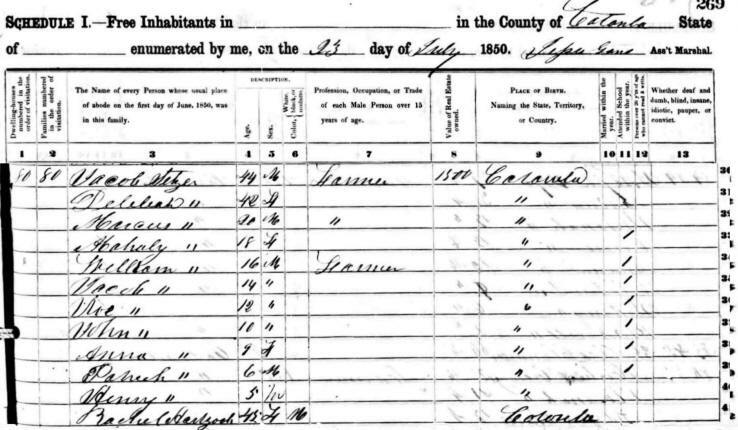 According to the 1850 Catawba County Census, Jake and Delila were living in Catawba County with their nine children and a Mulato woman by the name of Rachel Hartzook. Marcus was 20 years old at the time. His birth county is listed as Catawba, but the same portion of land was Lincoln County until 1842 when Catawba County was formed. Around 1853 Marcus married Harriett Yount. The 1860 Catawba County Census list those living on the family farm. They had two children: Lowrance (age 6) and James M. (age 3). There was also a "bound" servant, Sarah A. Shell (age 14), living on the family farm. Harriette " 30 F "
Lowrance " 6 M "
James M. " 3 M "
In 1860 the United States was less than 100 years old and the issue of slavery had become an uncompromising issue. By 1861 South Carolina had succeeded from the Union and there was a Civil War between the northern and southern states. Fighting commenced on April 12, 1861, when Confederate forces attacked a Federal military installation at Fort Sumter in South Carolina. All seven sons of Jake and Delilah Setzer served in the Civil War. Noah Monroe Setzer, age 23, seems to have been the first of Jacob Setzer's son's to enlist in the Confederate army. Noah joined Company A, 12th Regiment on 27 Apr 1861. John Wilburn Setzer, age 22, enlisted in Company K, 46th Regiment on 27 Mar 1862. On July 4, 1862, Marcus Elkanah (age 32), William Able (age 26), Jacob Harvey (age 25), Patrick Sylvanus (age 19), and Henry Theodore (age 16) enlisted as part of the Confederate army, leaving Jacob with a large farm and no sons to help run it. Marcus Elkanah enlisted on 04 Jul 1862 in Company E, 57th Regiment North Carolina Infantry. He died of disease as a POW on 21 Mar 1865 at Point Lookout, Maryland. The Civil War ended on 09 Apr 1865 when General Robert E. Lee surrendered at Appomattox Courthouse - just 2 1/2 weeks after Marcus' death. 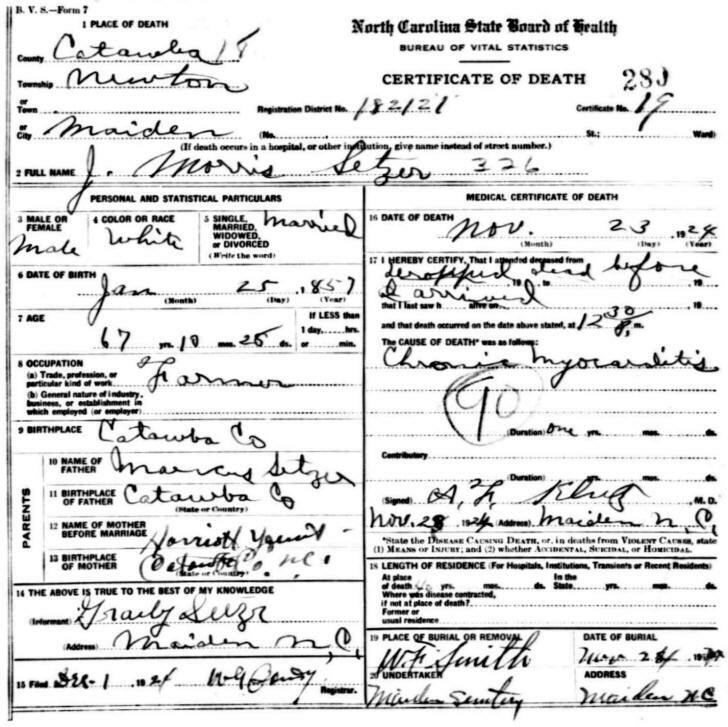 The 1880 Catawba County Census shows Harriett and her two youngest sons, James and Patrick, living on a farm near brother-in-law, Wilburn Setzer. Harriett's age is 50.
" Patrick H. W M 19 Son S " "
If you have additional photos or information about the Setzer family, please contact me.